I came to know Japan through its anime and manga culture, through Junichiro Tanizaki’s essay “In Praise of Shadows” and Akira Kurosawa’s film Dreams and the music of Yuki Kajiura, through the brutality of its soldiers toward the Philippines and other nations during World War II, through an array of sushi restaurants of varying quality, through statistics of its suicides, wacky game shows, offbeat products, gruesome urban legends, and Shinto creation myth. 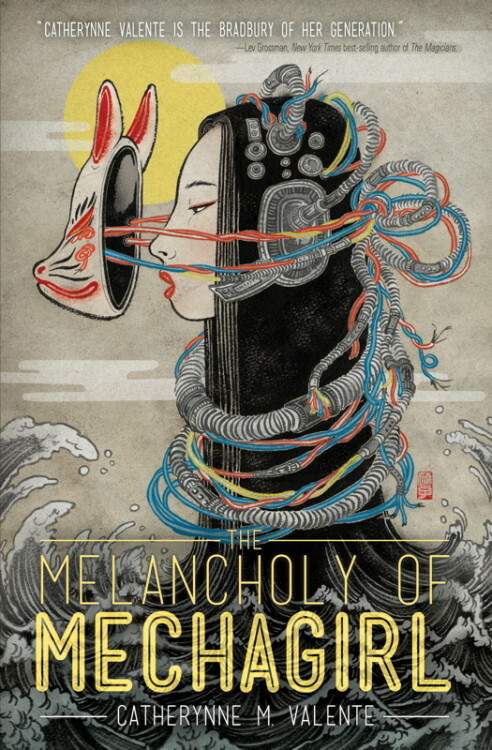 It will take several lifetimes to scratch the surface of Japan, but reading Catherynne M. Valente’s newest collection of (Japan-centered and Japan-tinted) short fiction and poetry, The Melancholy of Mechagirl, one gets the sense that—while by no means an in-depth look at the nation—she knows more than the average anime-addicted, J-pop culture-savvy gaijin ever will. It is hard to talk about this collection of science fiction and fantasy without talking about the author’s two-year experience as a lonely young army wife in a rural military town in Japan. Valente seemed to know this as well, judging from the afterword in which she artfully summarized that experience and established it as the anchoring point of any of her even remotely Japan-related fiction. I read this afterword first because I was genuinely curious about her fascination with Japan, having first encountered and fallen in love with her work in the Orphan’s Tales duology and the Fairyland series. But nobody else need read the afterword first, as it won’t affect the reading of the nine stories and four poems, many of them about a lonely foreign girl—often a writer, too—stuck in a strange, fascinating country. I’ve got to be honest, though. While Valente is at the top of her game in this collection, it’s her stories that manage to pull back or balance the lonely foreign writer girl situation that really strike a chord. Sometimes, the pain becomes too raw, too engulfing, and maybe at times too specific, as I can’t put myself in the shoes of any character imbued with this sort of angst? I find myself wanting to read more about, say, Kyorinrin and Tsuma rather than Kyorinrin’s roughly-imagined girl Akemi in the semiautobiographical, metafictional story “Ink, Water, Milk,” which is unique to the collection. Or sometimes, Valente manages to emulate the neatness and the strangeness of Japan a little too well, like in the aforementioned story or in “Fifteen Panels Depicting the Sadness of the Baku and the Jotai.” Maybe I have Victorian sensibilities, but I can’t seem to grow used to the idea of supernatural beings making love to inanimate objects (or inanimate objects making love to other inanimate objects, for that matter). “Ghosts of Gunkanjima” is a sad story about the inhabitants of the abandoned factory-island of Gunkanjima, but I know Valente is capable of the kind of sadness that makes you stop reading for a little while and try to even out your breathing. The award-winning “Thirteen Ways of Looking at Space/Time” was gorgeously written and a fun read (even if the scientific terms went over my head) because of the comparison of different creation myths and certain points of rebirth in the life of a science fiction writer, but I felt there was still something missing from it. The collection begins to pick up with “One Breath, One Stroke,” however. 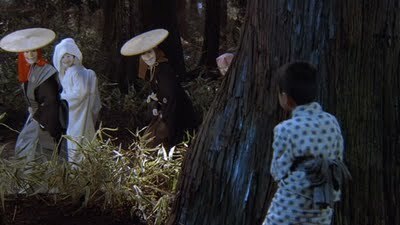 The dazzling parade of supernatural creatures somehow reminded me of a scene about walking into a kitsune wedding from Akira Kurosawa’s Dreams. There was something poignant about the struggle of Ko the old man and Yuu the calligraphy brush, who share the same body, trying to leave a house they can’t leave—the House of Second-hand Carnelian, whose one half is in the human world and the other in the supernatural world. The kitsune wedding party catches the boy watching their procession. “Story No. 6,” which is unique to the collection as well, is not your conventional story in that the plot is not in trying to catch the elusive Kami haunting old black-and-white reels of Japanese films, but in what happens to the characters and audience members that she takes along with her, never to be seen again. Also, it made me want to Google the films mentioned and find out if they really do have missing scenes and characters. I don’t go looking for science fiction to read, but sometimes, the stories I do come across are good fun and not at all like the jargon-heavy, techno-savvy stuff that make up much of the genre. “Fade to White” is one such story. I enjoyed the post-apocalyptic USA where everything down to gene and marriage pairings must be regulated, as well as following the story of Martin, who dreams of becoming a Husband, and secretly part-Japanese Sylvie, who would rather not be a Wife. You don’t get to find out what the amusing corrected TV commercial scripts interspersing the narrative are about until the end, but it’s well worth it. “Killswitch” is novel in that this is my first encounter with a piece of fiction dealing with video games, even if this one is about a near-unplayable game that terminates itself once the end of one of the playable character’s storylines is reached. With only 5,000 copies available, the said game has become an urban legend and people will do anything to crack the code. 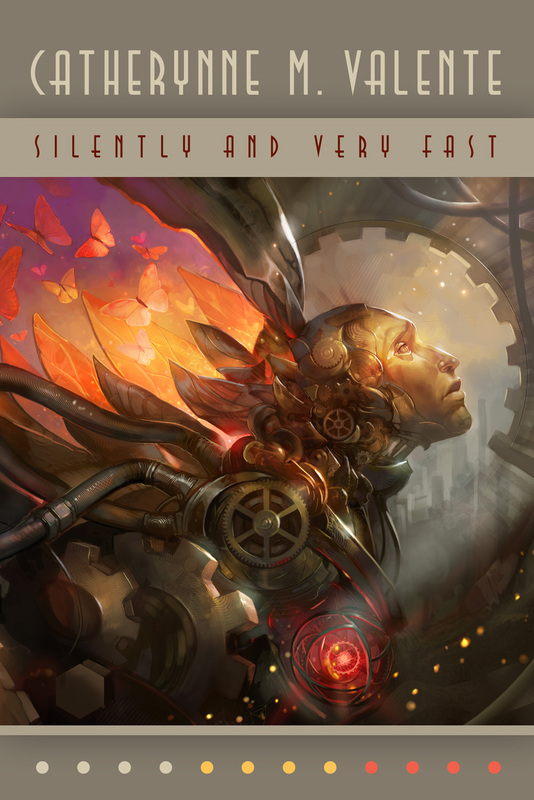 The four-part novella “Silently and Very Fast” earns all of its commendations. It will take a little patience to get through the beginning, as readers are immediately introduced to the strange world of Neva and her highly-evolved artificial intelligence, Elefsis. The novella follows Elefsis’s entire life, beginning with his/her/its creation as a less sophisticated Jarvis of the house of celebrated computer programmer Cassian Uoya-Agostino, and his growth as he/she/it is handed down from one vastly different family member to another over hundreds of years. Neva is a lonely girl here, but combined and complemented with the loneliness of Elefsis, it’s a loneliness that circles you until it becomes a nest you can safely, comfortably get warm in. This novella definitely kicked me in the gut. I highly recommend it. I wish I were qualified to talk about the poetry, but I am not. I will say, however, that I enjoyed the titular “The Melancholy of Mechagirl” and its rolling bubblegum-pop scientific jargon. “The Girl with Two Skins” was highly affecting (and probably my absolute favorite among the four poems), and “Memoirs of a Girl Who Failed to Be Born from a Peach” both sad and amusing. “The Emperor of Tsukayama Park” is probably the most “Japanese” of them all in that it uses a lot of nature imagery and evokes that sense of neatness and ephemerality that the Japanese prize and are known for. In that sense, it is also the one I understood the least, perhaps because it is the one poem less like fiction than all the others. All in all, The Melancholy of Mechagirl is a lot like wine and a lot like Japan itself—a heady, acquired taste. But once the taste is acquired, I definitely don’t mind getting tipsy with it. I recently finished the first Fairyland book and loved it. Debating whether I should go straight into the next book or check out some of her other work. I’m in the middle of the sequel, actually. But there’s no harm in checking out her other work in between. That’s what happened to me. :)) if you decide to check out her other work, I recommend The Orphan’s Tales: In the Night Garden.